The other week, I went to Steel City Con, the Pittsburgh Area’s valiant attempt at a comic con. Lots of vendors, bunch of B- and C-list TV celebs, usually two or three A-listers (last year I got autographs from Shannen Doherty AND Holly Marie Combs!!! ), and of course: tons of passionate, weird, lovable pop culture junkies, God love ’em. As I went through through my loot, I realized I had had a gay ol’ time. My two biggest gems? Action figures of Willow and Tara, and All New X-Men #17: aka newly-out Iceman’s first, big (I’m talking full-page panel) gay kiss. This is exceptional, you guys: Iceman has been part of the X-Verse since its very beginnings in 1963, one of the original five X-Men. So how did we get to this place fifty-four years later? It’s the long line of the quirkiest comic team family expanding its inherent diversity. Let’s take a look. From my personal collection. After searching all the comic vendors at Steel City Con, my efforts were rewarded. 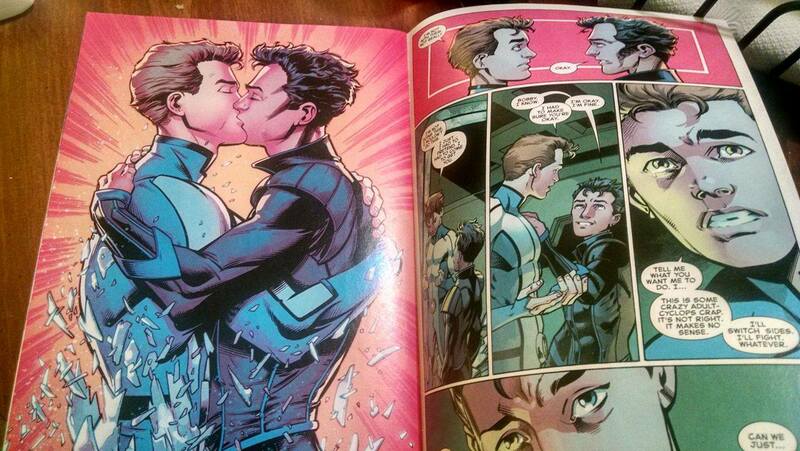 Makes my gay, mutant-loving heart so happy! 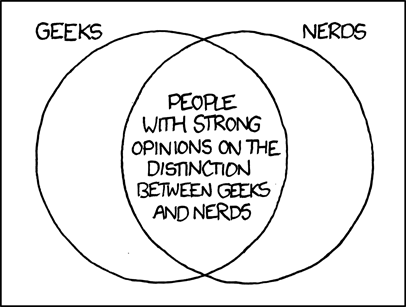 In my fifteen or so years of participation in geekdom, I’ve learned that there are two universal truths. 1. There are infinite shades of nerdity on the geek spectrum. 2. There are many people out there who still don’t get it. Being a nerd was always part of my core identity, though I took pride in calling myself a “nerd” over “geek.” Geeks were socially awkward, not smart, like me (doesn’t that sentence just radiate hypocrisy?). I prided myself on being some kind of upper echelon of social outcast, defining myself through criticizing others. It didn’t matter that I never actually envisioned who that social outcast was who sat on the lower rung of the social ladder. I wasn’t like “those” weirdos, whoever they were. So it really wasn’t a surprise when similar feelings resurfaced when I was invited to go check out Free Comic Book Day. I feel like I have been waiting all my life for an all-female Marvel team comic. Marvel doesn’t have the best history with female led titles. They cancelled some of their most popular titles like X-23 and She-Hulk, and some never even make it to a shelf when Marvel gets too nervous about “taking a risk” with a female-led title. Because Marvel is less likely to take chances on new titles, for the longest time DC Comics has been wiping the floor with Marvel in terms of female-led titles. DC has always had THE female comic with Wonder Woman, but has followed that title up with other consistent female led titles like Birds of Prey, Batwoman, Batgirl, Supergirl, and several others. When it comes to female representation in comics, Marvel tends to pale in comparison—until now. Recently, Marvel has been stepping up their game with titles like Captain Marvel, Red She-Hulk, and Journey into Mystery. Now finally, Marvel is giving us an all-female superhero team with Fearless Defenders! Right now, the team is more of a duo as the comic writers attempt to set up and build the team. In this first issue, we meet heroes Valkyrie and Misty Knight who fight mercenaries and zombies. Hell yeah! I personally never really knew much about Valkyrie and Misty Knight before this comic. I only knew a little of Valkyrie from Thor. Apparently, these characters were chosen to introduce the fans to some minor, but awesome characters. We have a diverse cast developing with Misty Knight as an awesome black female character, while Valkyrie and Annabelle Riggs, an archaeologist and friend of Misty’s, seem to both be queer characters. The comic even provides us with an awesome lesbian kiss between Valkyrie and Annabelle. The story is awesome and well written. It moves at a fast pace, keeping the reader entertained. Cullen Bunn, the writer, provides a feel for the characters so that readers who have never heard of Misty Knight or Valkyrie won’t be terribly confused. My only and, quite honestly, biggest problem is with the art. The cover art is to die for, and I really wish Mark Brooks would have done the art for the comic book as well. Will Sliney, the main artist, constantly gives the characters annoying poses worthy of the Hawkeye Initiative, especially to poor Misty Knight who is really over-sexualized. Aside from the sexist poses, I just really don’t like the art. During the awesome lesbian kiss I noticed that Valkyrie’s hand was really poorly drawn and defined. Her fingers were clumped together making her hand look like that of a Barbie doll. But please, please, please, don’t let the art scare you away. Fearless Defenders truly is an awesome comic and it needs to be supported if Marvel is going to continue to publish it. It has diversity and a great story. It’s definitely a comic worth picking up. So You Want to Read Comic Books 2.0: Marceline Time—c’mon, grab your Scream Queens! We usually use this column to recommend the superhero books that we think you should pick up. (At least I do.) And that trend is not likely to stop (I’ve just started reading the new Journey into Mystery arc with Sif and The All-New X-Men, so look forward to those in a potential future post). But today we’re not talking about superheroes. We’re talking about cartoon characters. “Isn’t there some overlap?” You ask. Well, yes, superheroes can be cartoon characters. But today I’m talking about characters that were animated first, and then expanded to comics instead of vice-versa—and in particular, I’m talking about Adventure Time. Simone eventually released a statement on her tumblr saying how grateful she was to work on Batgirl and thanked DC for the opportunity. You can read her statement here. The dismissal of Gail Simone from Batgirl is confusing, infuriating, and altogether disheartening, especially when it affects a beloved character and reveals how DC seems to show so little regard for their female employees. DC has not stated why Simone was removed from the Batgirl title, nor has it been mentioned who would be replacing Simone, or if she would be writing on any other titles. It’s very strange indeed that Simone is being removed, especially from this book. Simone, herself pointed out how her run on the current Batgirl was praised twice in the New York Times and had many sell-out issues. Furthermore, Gail Simone and Batgirl go together like peanut butter and jelly. There is no one better than an author who has been writing Barbara Gordon’s character since long before the reboot. Her writing on Birds of Prey and her interpretation of Barbara as Oracle moved many people, and has made Simone, in my opinion, one of the greatest and most well-known comic book writers in the industry. I love comic books. Love them. I still remember my first comic book. I was in Kindergarten. 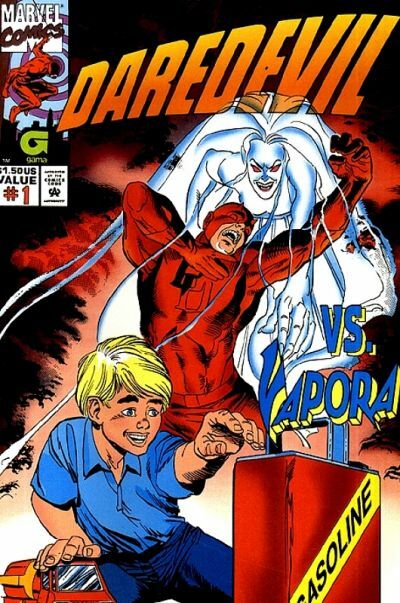 A firefighter was discussing fire safety and as part of the free stuff he was giving out, I received a comic book titled Daredevil vs. Vapora #1. Looking back on it, I realize how absolutely cheap this marketing ploy was. But man, did I love that comic. I read it until it fell apart. Eventually, I looked into other comics. I found out that the Batman cartoon that I knew and loved also was a comic book, and from then on, I was hooked. And it is because I’m hooked to comic books that I come to you with this tidbit; comic book writers are going to kill this genre.